It’s no secret. My kids did not start out with the best example of healthy eating. Pizza, pop for breakfast, fast and processed food was the norm in my house. There were some weeks that we probably didn’t eat ANY fresh fruit or vegetables. Yes, that is pretty terrible I know. So what did we do to turn it all around and start teaching healthy eating habits? 1. Eat together as a family. Whether it be breakfast, lunch, or dinner. Pick a meal and sit down together. Turn off the TV and start the conversation. This is a great time to talk about food. Be intentional at first. Start the conversation………What are your favorite fruits, vegetables, grains……..you get the picture. Eating together is comforting for children. Help them to relax and discover a whole new side of them. 2. Correct portion sizes. This is one we are still working on. I use the word “correct” because kids are all different. Some kids eat too much and some eat too little. What we are working on here is that they get the appropriate portion for their size and activity level. Looking to shrink portions? I suggest smaller plates and forks to start with. The smaller plate will look full with less food. Looking to increase portions for your picky eater. Make sure to include a wide variety of foods to choose from. I find that choices work real well when trying to provide a balanced meal. Not a different meal……just choices within that meal. 3. Cook more meals at home. I promise you it is easier than it looks. Get your family into the kitchen to help. Restaurant meals tend to have more salt, fat, and sugar in them than meals prepared at home. Even when you think you or ordering healthy at a restaurant, you likely are not. Cooking meals at home is a great way of showing the importance of food to your kids. Introduce them to new foods. You may be surprised what they are willing to eat if they are the ones cooking it. 4. Include your kids in the process. As a busy mom, I know there is more to preparing balanced nutrition than simply cooking a meal. Let your kids in on all of that. Take them to the grocery store and show them some labels. Let them know what ingredients you are trying to avoid and why. Take them on a scavenger hunt through the store in search of foods without high fructose corn syrup. They will quickly discover if they stay on the perimeter of the store they can win that contest. Let them help make their lunches. Show them the importance of including protein, fruits, vegetables, dairy, and whole grains in their meals. 5. Keep a variety of healthy snacks available. Teach your children about empty calories and how they are really a waste of eating energy. You are not a mean mom. You love your children and that is why you want them to eat the most nutrient-dense foods available. By giving them fruits, veggies, and whole grain snacks, they can grow up to be big and strong like their favorite super hero. Education: I mentioned this a few times as part of the other tips, but I have found that even from a very young age children really understand nutrition. They may or may not like certain foods, but they can grasp that some foods are healthy and some are not. Give them the tools they need to make healthy decisions. 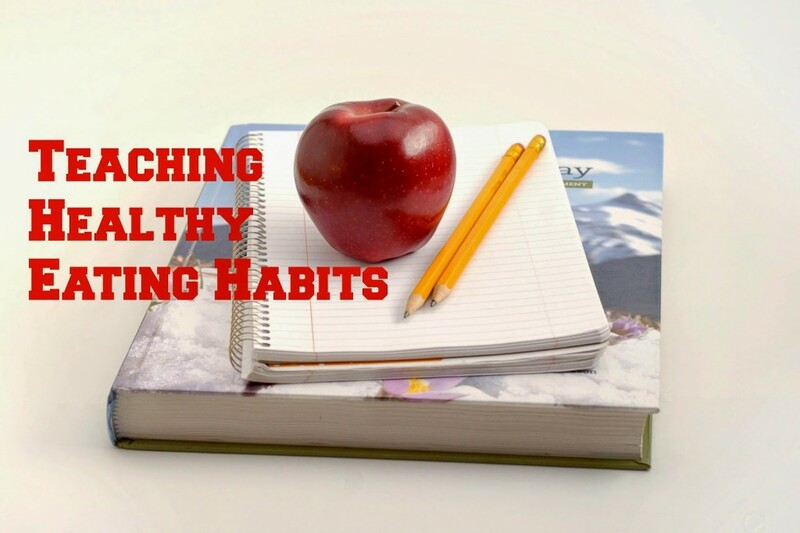 What have you found to be most helpful in teaching your kids healthy eating habits? Have they ever surprised you by choosing healthy over junk food? What about the other way around? How many days a week do you eat together. I totally think getting kids in the kitchen and getting them cooking is the best! Instill a love for cooking real food and you are good to go! Those are wise words Rebecca! Getting kids in the kitchen is a great way to teach them healthy eating and it's fun! Great tips, Christina! I wish I had done better with some of these when our kids were younger. Thanks Gaye! I bet your boys learned quite a lot about healthy living from you. Sadly, I think I make the kids eat better than I do at times. i love when the kids join in the kitchen! Make sure you are taking care of yourself too Momma, Those kiddos need you to be healthy. Cooking with kids really is fun family time. These are all great ideas! Sitting down to eat together as a family is such a hard one with all of the after school activities. I agree that kids' activities make family dinner's tough. That's why we frequently don't eat dinner till 8:00! Great tips!! My husband and I are trying to raise Harper in a healthier way than we were brought up. I can't wait until she's old enough to really get involved with food preparation! Healthy eating habits are easier to start at a younger age. Harper will grow up with healthy eating being the norm. Food prep can start at an early age. Have fun! I love these tips! Especially eating together and involving the kids in the process. I can't wait to get my son involved in cooking! Now we just need to work on portion sizes! Portion sizes can be tough, especially when they can change all of the time depending on activity. My daughter now gets jealous when I have one of the other kids help me cook. She loves it that much. Your little guy isn't too far away from helping with simple tasks.